139/365(+1), a photo by Luca Rossini on Flickr. It is our wedding anniversary, today. It’s six years. We got married in 2006, and one month later we moved to Leiden, the Netherlands, where we celebrated at least one anniversary. I don’t know how it is possible, we never noticed that on the same day, the 29th of June, Leiden gets crazy with the Lakenfeesten. We didn’t really get what it is about, but apparently it’s related with the textile industry of the town. If you know any better, please feel free to post a comment. As any respectable celebration in this town, the event comes with ultra-loud electronic music, weird boats and a fun-fair. The latter is as always big, shiny and all about motion-sickness. You can choose many different ways to get your body aggressively shook, amongst which the top is the “No Limit” amusement, which puts you in a free falling and rotating capsule with other seven drunk fellows. 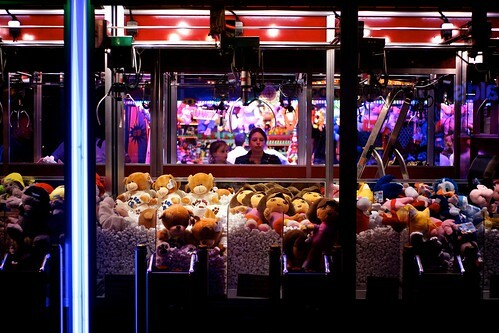 There are also family-oriented draws, like the shooting gallery (usually played by couples, with the male trying to shoot his way out to a happy ending with the date) and the claw machines. Among all the games, claw machines are those who always convinced me least. Especially in the last years, those systems evolved into mechatronic systems able to scientifically keep the player from winning. However, I just found this guy, Matt3756, who has posted on his Arcade Videos youtube channel almost eighty video tutorials on how to win at claw machines. He seems to know what he’s talking about, so maybe I should study his tips and give those draws a second chance. Who knows, I could come back home with a giant teddy bear so my daughter would finally love me forever.